Finalist for the 2018 Grand Prix du Livre de MontréalA modern-day fable and feminist bildungsroman, The Faerie Devouring tells the story of the sprite, her absent mother (who dies in childbirth), and a brood of fatherless boys all raised by Gramma, a stalwart matriarch and wicked faerie godmother. From her rural childhood with its crudeness and toil to an urban rebellion with its glittering pleasures, the sprite struggles with and ultimately overcomes the burden of genealogy. 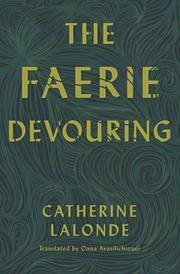 A literary spell cast by the daring and critically-acclaimed Quebecoise author Catherine Lalonde and reimagined by the award-winning poet and translator Oana Avasilichioaei, this feral incantation comes alive through disenchantment, desire, phantasmagoria, defiant imagination, and unruly language.